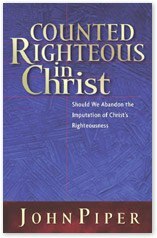 Should We Abandon the Imputation of Christ’s Righteousness? Counted Righteous in Christ by John Piper is available free thanks to Desiring God. Counted Righteous in Christ considers whether Christians are just forgiven, or whether they have the righteousness of Christ. To get the free pdf download of “Counted Righteous in Christ” simply go to the Desiring God website at this link and then select the ‘Download(PDF)’ or ‘Download this book (PDF)’ link. Martin Luther said that if we understand justification “we are in the clearest light; if we do not know it, we dwell in the densest darkness.” And now, in this new and important book, John Piper accepts Luther’s challenge. He points out that we need to see ourselves as having been recipients of the imputation of Christ’s righteousness and therefore enjoy full acceptance with God and the everlasting inheritance of life and joy.